Fashion Week? More like Yohji Yamamoto Week. Yea, sorry about that. Someday, I promise, I'll be more proactive about varying my Fashion Week attendance. So I totally hit up the Meatpacking District joint opening of the Y-3 store and the Yohji Yamamoto store. It was also one of those nights where I had many spots on the "list," but everyone I invited was either sick or uninterested. So this party of 1 quickly did what anyone trying to pass as a fashion week insider would do: appeared as unaffected as possible, all the while stalking the pretty drink and hors d'oeuvres boys with my peripheral vision. 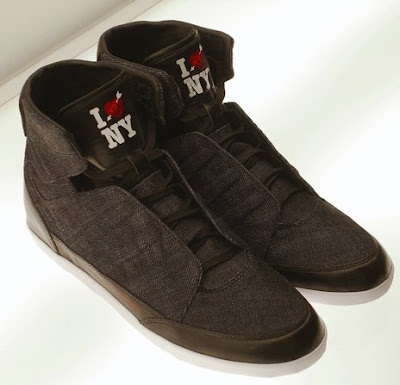 Free to be my product-obsessed self, I passed the ice bar at Y-3 only to stop in my tracks and affectionately pet the limited-to-50 NY-edition $500 Y-3 sneaks (see below), made with denim from Yohji's atelier. Not a minute later did I spy my love across the room, and made a bee-line before the server with the pretzels could block my way. There it was...the pair of Y-3 bootie wedges featured in the F/W 07 ad campaign (below)! 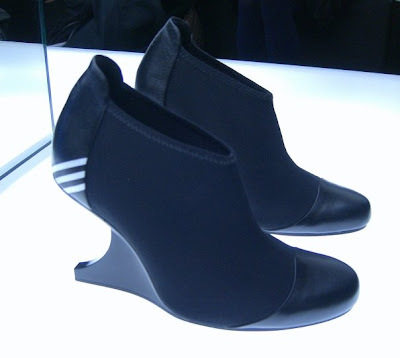 You may think they were inspired by the odd heels on MJ's S/S 08 shoes, but NO! those came a full season after these. Anyways, both stores were gorgeous, and the merchandising was sooo intensively thought out that I wonder how different they will look once the star pieces sell out. 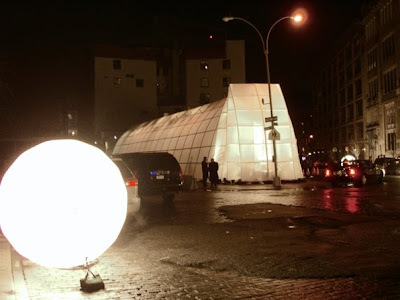 Also, the triangular brick Yohji store was covered in a temporary plastic cocoon (see pic above) which effectively glowed, and made it seem (along with those light balls which appear to have fallen onto the street straight from the S/S 08 YSL runway) that a ginormous ethereal bug has made a comfy home in the MePa.